There's nothing like taking a moment to indulge in the finer things in life, and you can give anyone on your gift list that very thing with this delicious little treat. 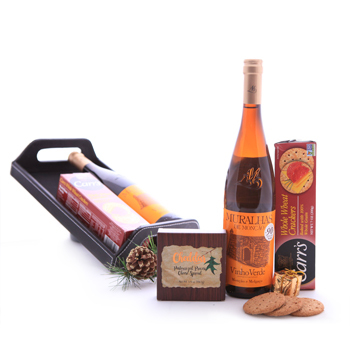 A bottle refreshing Dry White Wine (750 ml), is accompanied by mouthwatering, creamy Cheese Spread (100 gr.) and crisp Whole Wheat Crackers (170 gr.). Whether it's a holiday hurrah, a birthday bash, or a well-deserved thank you, they're going to love when you send them A bite with White Wine. Attention: Gift packaging varies based on delivery location and the season. Your gift may be delivered in a tray, a gift box, or a traditional basket.